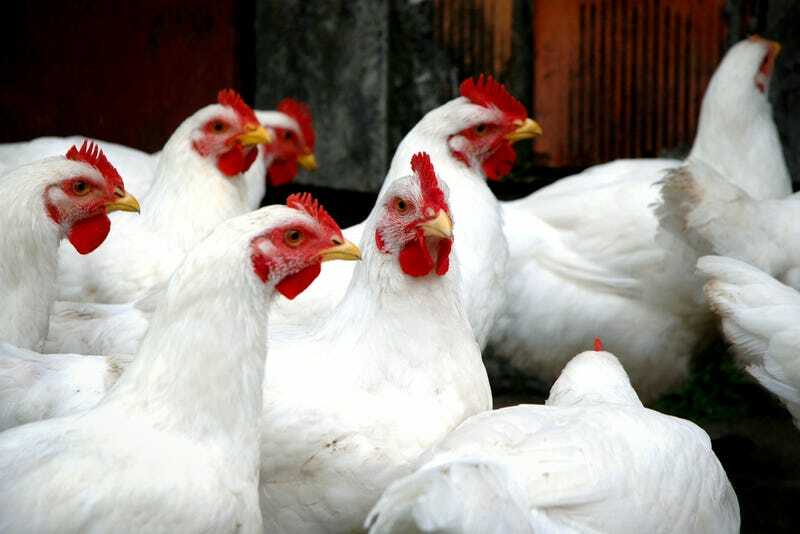 Actual CDC Warning to Farmers: "Don't Kiss Chickens"
Sound advice, CDC! But, uh, just why did you guys feel the need to issue this warning in the first place? It’s because we’re in the midst of a series of small Salmonella outbreaks, with just under 200 cases reported thus far. A handful of these were traced back to frozen chickens, but the vast majority were from live birds, leading the CDC (as is its habit) to put out a series of pamphlets on how to avoid this latest threat. Many ill people in these outbreaks reported bringing the live poultry into their homes, and others reported kissing or cuddling with the live poultry. These behaviors increase a person’s risk of a Salmonella infection. ...okay. Of course, the whole thing becomes a little clearer when you read a little further on who is getting sick and find that the latest outbreak is centered mostly in backyard and hobby farms. Look, people, I know you think that little HENry VIII and Chick Corea, Jr. are just your funny, feathery pets, but they are not. They are tiny, disease-ridden dinosaurs, who have spent the last several years watching you kidnap, and then eat, their babies. You’re not friends. You’re barely not enemies. So—in the wise words of the CDC—don’t kiss your chickens. Don’t bring them into the house to hang out. And don’t ever try to cuddle with them. And, if you do, expect that a case of salmonella just might be on its way.